It's science! This infographic shows men are better at managing money than credit. But trust me when I say, these stats go out of the window when it comes to men dating women they're attracted to. Do you know why? Ladies, do you disagree? Share your thoughts in the comments below. 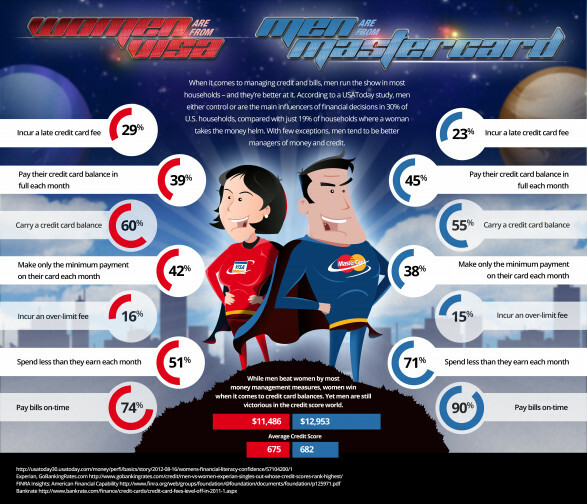 Women Are From Visa, Men Are From MasterCard	infographic by sramzee. In my occasional snooping around on Quora, I came across this answer, by Oliver Emberton. It was later picked up by AskMen so I thought it would be good to share here. Enjoy. Imagine how you'd feel if your dream girl said she might "settle" for you. She had someone better in mind, but he was out of reach, so with reluctance she decided you'd have to do. Belittled? Inadequate? Pathetic? Don't do that to someone else. OK, so you want this ideal girl? Chances are she probably isn't the one you think she is -- but that doesn't mean the journey is pointless. It could be the wake-up call you need. One of the wonderful and horrendously unfair things about being a man is you have huge opportunity to increase your own attractiveness. Whilst women tend to be judged more by their looks, men tend to be judged more by who and what they are. That's good news for you, especially with your current attitude -- the scope for improvement is likely massive. Firstly, forget about chasing women. They don't find desperation attractive, and you need your concentration elsewhere. Notice the most attractive guys rarely if ever chase. Notice the least attractive are whiny, clingy and fawning. Don't be one of them. Now you need to craft a personal mission to improve yourself. This will be deeply personal to you, but generally you'll want to make the most of your health, wealth, appearance, social awareness and develop a broad range of interests and skills. This is not a 20-minute exercise, and if you need one of those, you probably should go back to feeling miserable. Do something to inspire others. Do something to inspire yourself. You'll quite literally be a better person, and a damn sight more attractive. Your life should be a testament to greatness, not a self-piteous whine. Chances are your ideal girl really isn't. It sounds like you're so attached to her as an ideal you can't see her as a person anymore, and clinging on to that thought is only making you depressed. You need to direct those energies elsewhere. You and you alone hold the power to turn it around and make something more of yourself. Your life is your story to write -- and the hero always gets the girl. I recently came across an article highlighting Boston as the best place for bachelors, by statistical research. It’s funny how you can take different variables and one shift can make Indianapolis, Indiana the best place for guys. This is why I never buy into these things. Just look at what they qualified as a date: a 12-inch Pizza Hut pizza, movie ticket and 6-pack of Heineken. Pizza Hut? Heineken? I mean, I'm more of a Domino's and Yuengling kind of guy, but seriously? While these are great for content, they’re never accurate. Do a simple Google search on “best places to meet women,” and look at how many different cities come up. As much as we love crunching the numbers and seeing what comes up, the truth comes down to one thing. As much as this article says Boston is the best place to meet women, Boston serves as my biggest client base. How can it be so easy to meet women, yet so many guys look for our help? Social skills. With the right social skills, you could go to Lincoln, Nebraska and meet any woman you’d like to date. So while these articles can serve as a point of reference, it's important to understand that while there may a ton of options available as a guy, it doesn’t mean your odds are better. You create your own odds, no matter where you live. Now that we’re past the halfway point in January and the motivation and buzz of the new year has passed, it’s up to us to keep the momentum going throughout 2013. The best way to start is by taking your resolution list, and burning it. I would love to see someone take a picture / video of this. Not only do I hate resolutions, some people are just awful at remembering their 30-item list. Just look at the dropoff of gym-goers since January 1st. The truth is, the longer the list, the more overwhelmed you'll get and less likely you'll take ACTION, let alone accomplish anything. The important thing here is to keep things simple -- and the easiest way to do that is focus on a theme for the year. So for 2013, the theme we’ll use to guide our development and future success is TRUST. For some of you, that might be too much “flower power,” but the truth is when you trust yourself, it’s hard to come short of success. In other words, doubt and skepticism for any reason other than to challenge the status quo will hold you back. This is not only important for your dating life, but for other aspects as well. Here are three points to building trust that we’ll focus on throughout the year. When you focus on your own personal development and create more consistentcy in your life, you trust yourself more and project that out to people. People want to be around those they can trust. It’s imperative when building comfort with a woman you're attracted to. Don’t just talk the talk, walk the walk. Follow through is so important in dating, from telling someone you’re going to call them, to other levels of commitment you agree to. Being unreliable is one of the worst characteristics anyone can have. Speak openly, honestly without apology, and explain your reasoning. And unless she proves otherwise, assume she is trustworthy. When you see the good in people and shift focus from what you think might be bad, it makes it easier to have genuine connections with people. And yes, there is great risk in trusting -- but think about the risk in NOT trusting. When you extend trust, it becomes contagious; people extend it back to you. When you hold trust back, people tend to hold theirs back, leading to distrust. But in order to extend trust, trust needs to originate from within. This isn’t about going into situations blind or believe everything you see / hear. This is about being smart with your judgment so you can minimize the risks you take and open up new doors filled with possibilities. This the global theme. On Tuesday, we'll get into specifics. NEWS: This post is written by Jamie Bardwell. Get to know him more on our Staff Page. Hey what’s your type? What type of guy do you normally go for? Am I your type? On some level we feel that asking these types of questions will yield some accurate insights into a woman’s dating preferences and the characteristics that she finds attractive in a man, that ultimately she finds admirable enough to express a desire for. Perhaps more sneakily, we feel that by asking this question we can move towards her ideal type of guy by meeting her strict criteria!